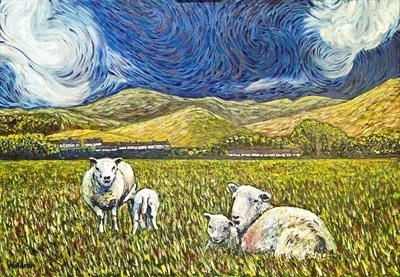 Oil on Canvas post-impressionist painting based on sheep (peace) against a Cumbrian backdrop (turmoil). Use of tumultuous brush-strokes (evocative of Van Gogh) express the emotion of peace disturbed by turmoil in my own life. I have added blood red brush marks as symbolic of the Blood of Christ. Limited edition prints on canvas will exactly mirror the original. 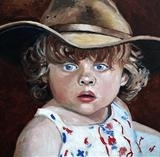 The original is for sale at £720 unframed. I was going through an unexpected time of turmoil (divorce) when I started this. Then I visited Arles where Van Gogh lived and was hospitalised. His work is everywhere and had an impression on my already strongly coloured work. I was painting with several excellent artists including "Pete the Street" Peter Brown and Norman Telling (post impressionist, romantic painter and came back to completely change this painting. It needs varnish and frame in about 12 months.